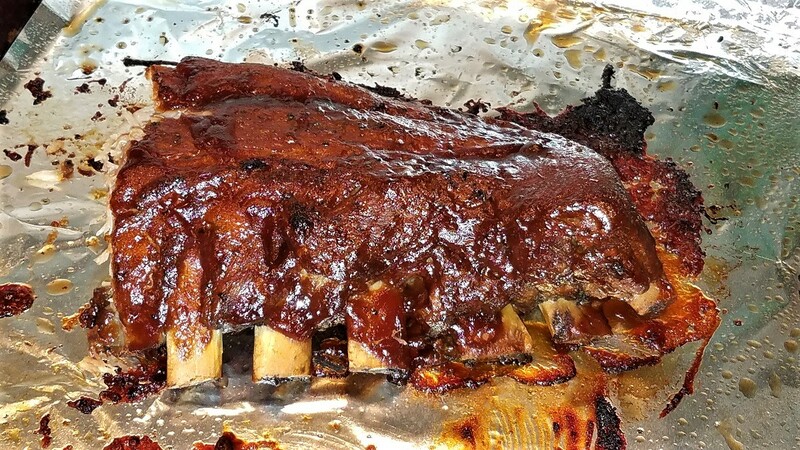 Do you enjoy ribs? 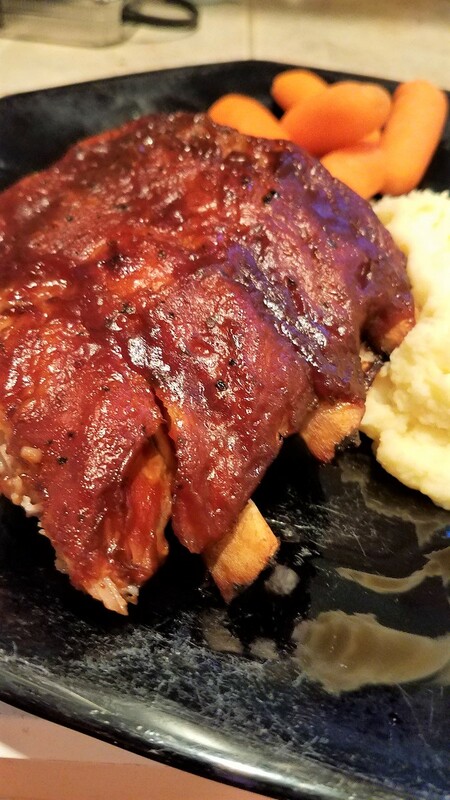 Like really good, fall off the bone, covered in sweet n' tangy sauce, need three napkins and most likely an oversize bib for your shirt RIBS? Do you have an hour? 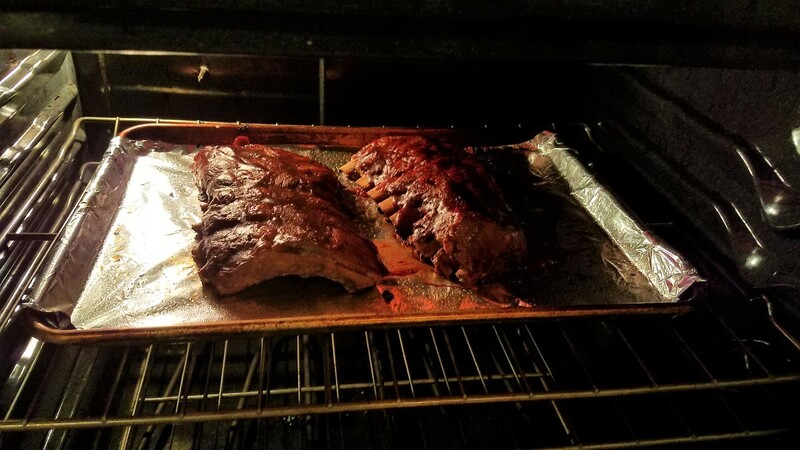 What if I told you it was possible to go from slab of raw ribs to tender BBQ perfection in about an hour. Magic, you say? Almost. 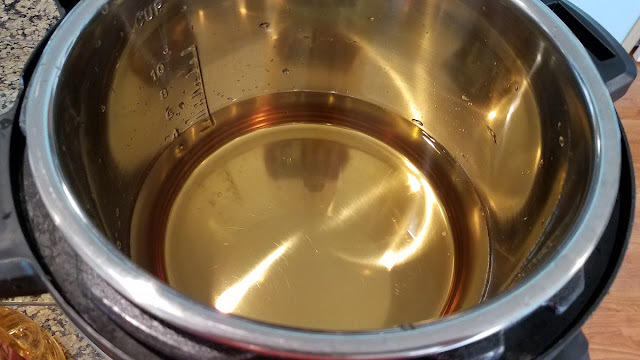 This wizardly device known as the Instant Pot has not only defied all laws of cooking physics, but it has converted me into a full-fledged believer. Well I purchased the Instant Pot a while back, and I've done the basic boiling water test (hidden behind a pantry door in case it exploded), I've made perfect artichokes in 20 minutes multiple times (standing right in front of the machine with only slight trepidation), and made some delicious quick meals involving frozen chicken breasts in 15 minutes (without a second thought), much to the amazement of myself and my family. 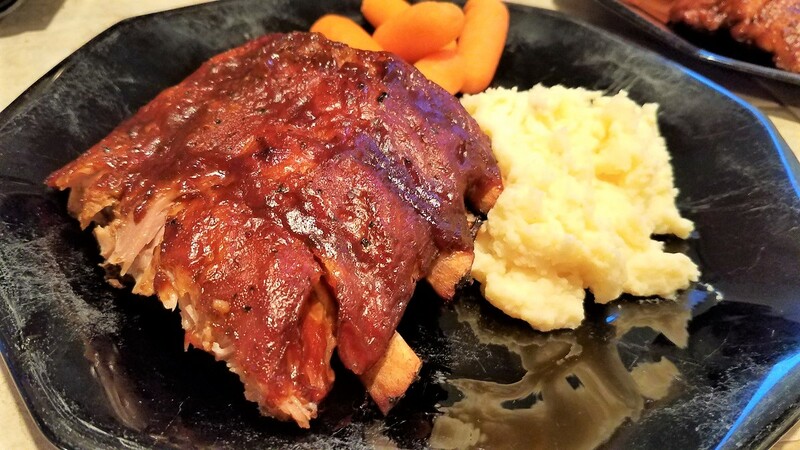 I've joined the Instant pot Facebook page (I highly recommend) and it was there I kept seeing recipes for these delectable looking BBQ ribs float by. Ribs are one of my favorite things. The only trouble is, I don't like wasting meat or ruining it in anyway, and my fear of not getting something right or wrecking a meal has made me shy away from buying cuts of meat. 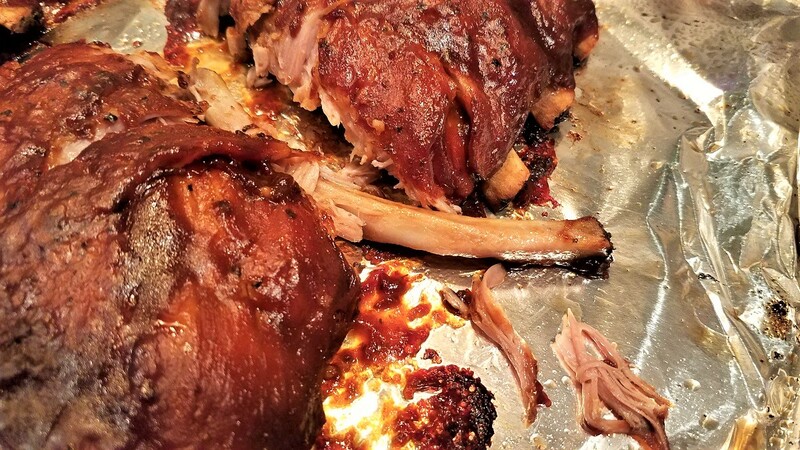 One day I told my hubby bravely... "I would like to try ribs in the pressure cooker next." No less than 2 hours later he appears with a slab O' ribs. I think that's code for - he's pretty much on board. Okay, lets DO this. The recipe we decide to try is from Jason over at the "Great Chow" on you tube. 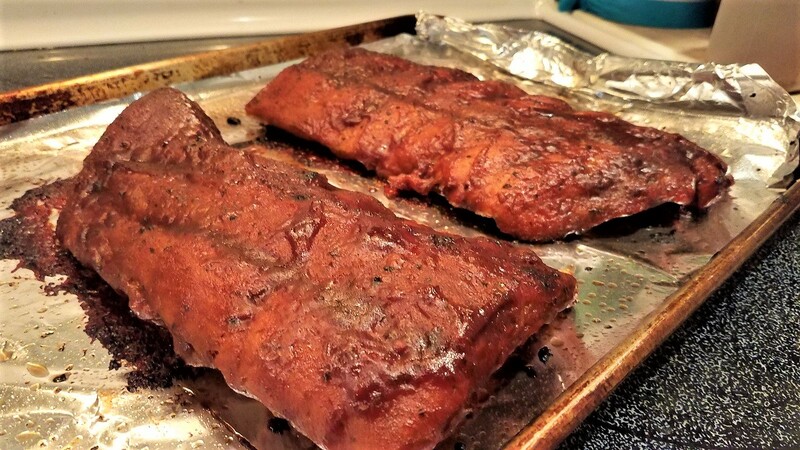 It seemed simple, straight forward, only had a few ingredients, and the ribs looked quite tasty. 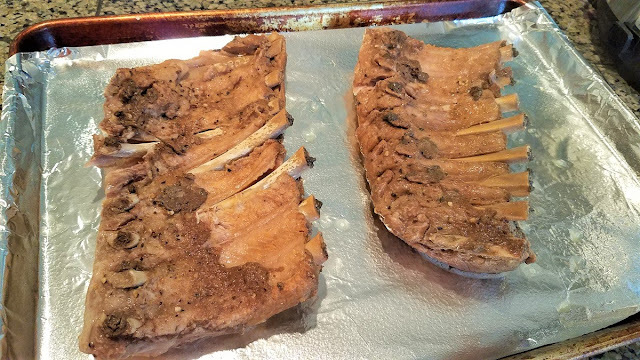 We found these ribs on sale for $2.97 a pound, and recently found them for $1.99 a pound, we're planning on stocking up. So the first thing you want to do is remove the secret "invisible" silver skin from the underside of the ribs. Flip them to the back side and carefully feel around on one end and pull up a little. I used a paper towel because first of all touching raw meat gives me the heebie jeebies, but second of all it give you a better grip to pull. All of the sudden this thin sheet of something started to come up as you pull steadily. Hey I actually DID it!! Pour four cups of apple juice into the Instant Pot, and about 1/2 cup to 1 cup (or two glugs) of apple cider vinegar. Turn the pot on to "saute" to get the liquid to heat up a bit (until it's warm and steaming). 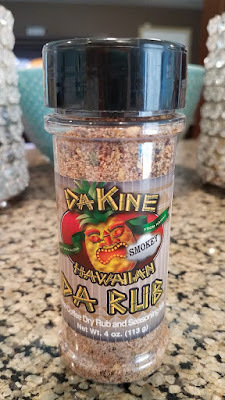 We added an extra step to the original recipe because we wanted to add a rub or little bit of seasoning to the meat. 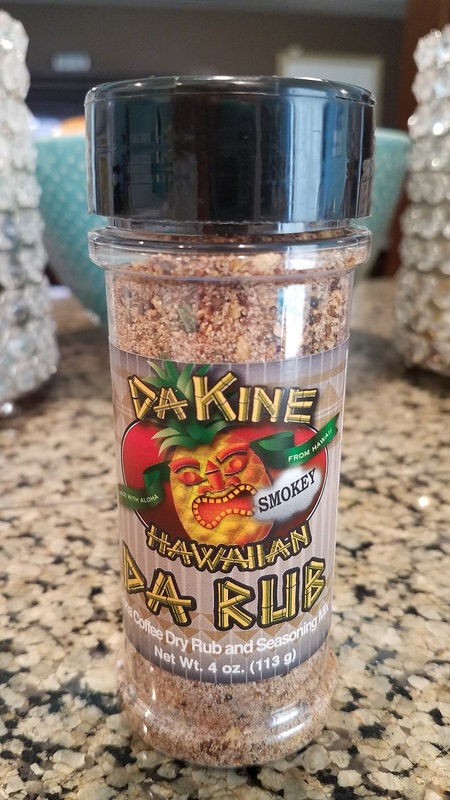 My friend recently returned from Hawaii with this little gem... which contains, salt, pepper, paprika, cane sugar, Kona coffee, and dried parsley. It said it was great with pork and seemed like the perfect thing to add. 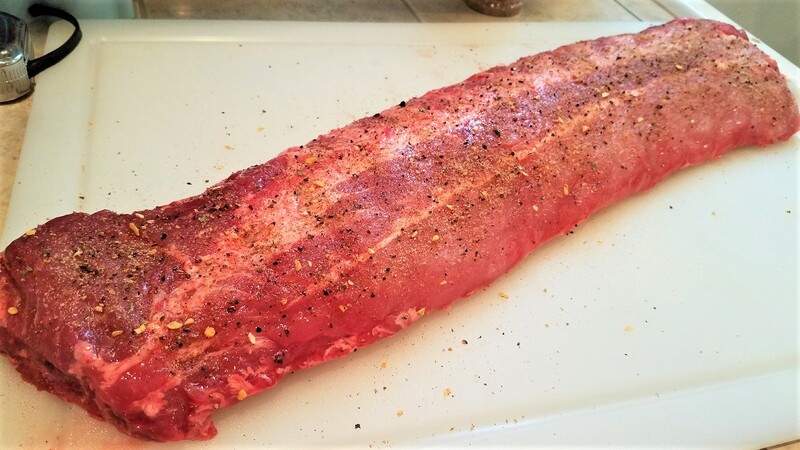 Sprinkle on the rub and pat into the meat on both sides. (This part is optional, you can do this whole recipe with just the first four original ingredients). Next he said to put the meat in the pot in the warm liquid. 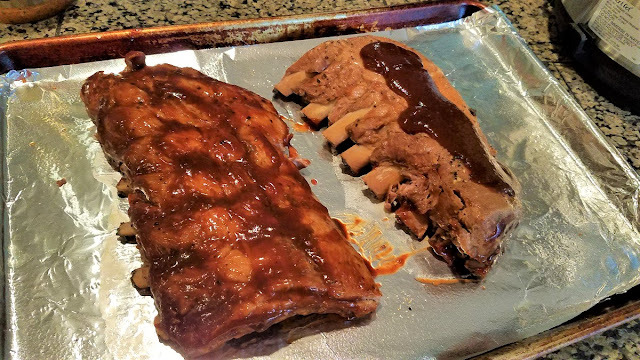 Our rack of ribs were a little long, so we cut in in half. 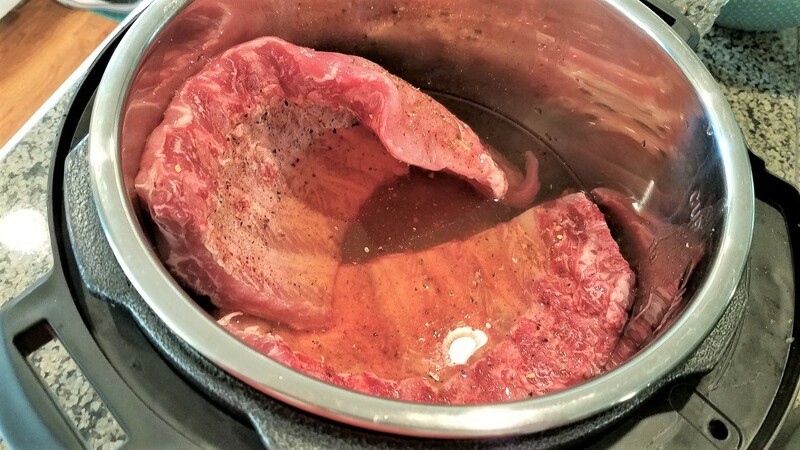 I was slightly worried because some people recommended only putting a small amount of liquid in the bottom and have the meat resting on the trivet above it to steam the meat. But we did as instructed and covered the meat with the liquid. I was also concerned that the apple cider vinegar would give a funky taste to the meat, but alas, I was wrong. Apparently the apple cider vinegar is an acid that tenderizes the meat and I can attest that there was no aftertaste at all, only that sought-after delicious meat-heaven taste. Into the Apple juice/cider vinegar bath with ye! 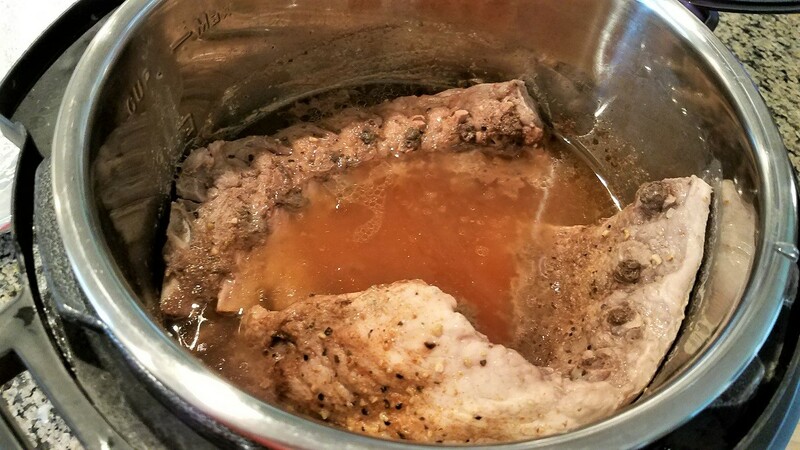 After the meat is safely in the liquid (thicker side down), seal up the Instant Pot, make sure the release valve is set for the sealing position and set the pot for "meat/stew" and check that it's set at "high pressure" and change the set time of 35 minutes down to 32 minutes. 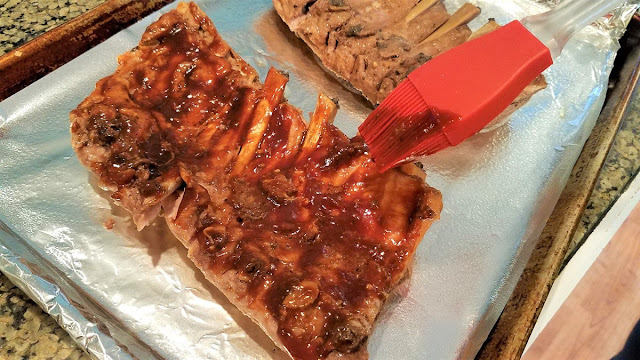 Prepare a foil lined pan with a little cooking spray and carefully place the cooked ribs down on the pan. They will be almost falling apart. Slather the under side with your favorite BBQ sauce. 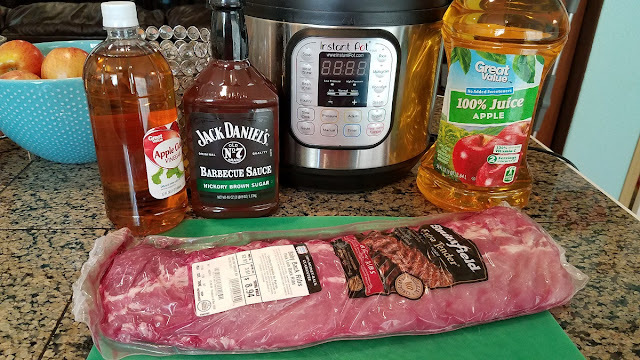 We decided to try Jack Daniels Hickory Brown Sugar BBQ sauce and it was spectacular. Then carefully flip the over and slather the other side. 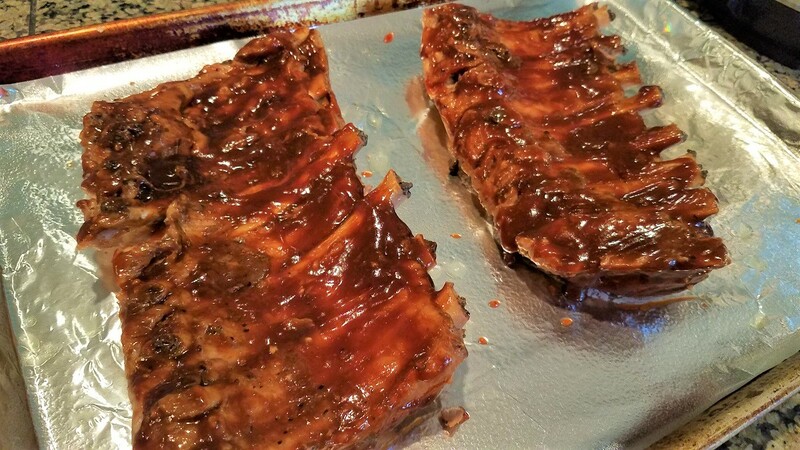 Put the pan of ribs in a 450º oven for 10-15 minutes to caramelize the BBQ sauce. We also broiled them for a few minutes right before taking them out to make the tops all brown and bubbly. Pull the finished awesomeness out of the oven and let it rest for about 5 minutes (mostly so you don't burn your mouth). How is this even POSSIBLE in 32 minutes?? Fork tender and so good! Mmmmmm smell that tangy BBQ sauce. That Jack Daniel knows whats up! Serve with mashed potatoes and veggies, or corn on the cob and a side salad and your are in business! 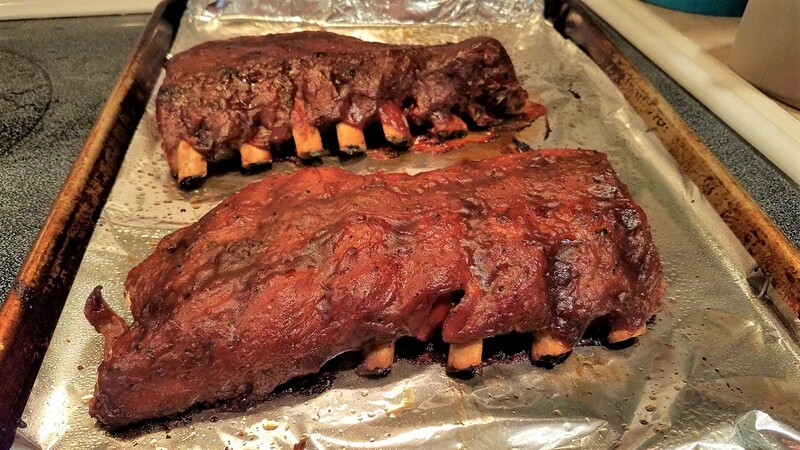 I'd like to thank Jason over at the "Great Chow" for this simple, yet amazing ribs recipe. We could not have had better or easier instructions, and we were thrilled to get a such perfect BBQ baby back ribs meal and on our first attempt too. So I am a total convert. I used to buy ribs already made, sauced, ready to heat up. 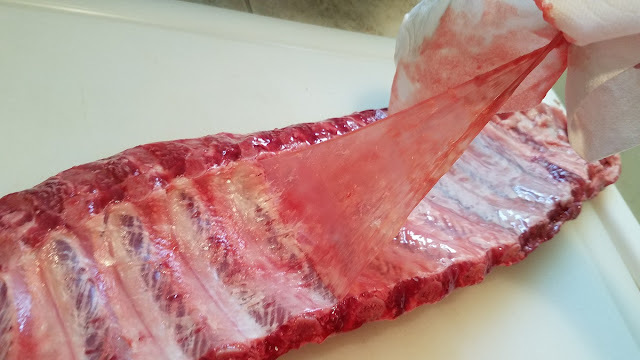 I'm never going back again these will be my go to ribs, and hubby mentioned that even if this is a starting off point for us to get inspired and experiment with these ribs as is were absolutely amazing. 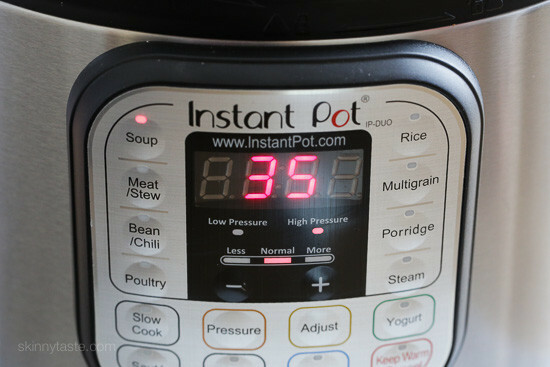 No go get yourself an Instant Pot, print up the recipe here, and start eating some good grub! Enjoy!